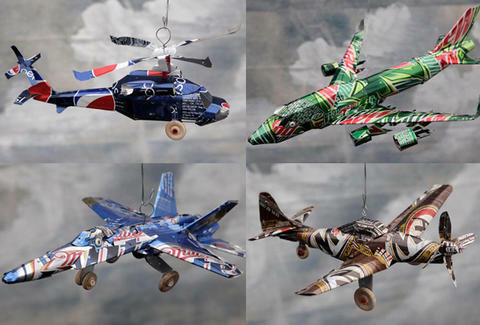 Fighter Jets/Attack Copters Channel your inner Lou Gossett Jr. with a Dr. Pepper-built F-15 Eagle, a UH-60 Black Hawk chopper, or a massive Budweiser B-52H Stratofortress, not to be confused with "straddle fortress", which is what a frisky Paris Hilton does when visiting Castle Island. Commercial/Transport Aircraft For models cool enough to lure Howard Hughes out of the room, there are iconic people-movers like an early '40s twin-prop DC-3 made from a Coke can, a Mountain Dew Boeing 747, and Lockheed's versatile workhorse, the C-130 Hercules, as opposed to "130-See Hercules", which would be the headline for a height Kevin Sorbo's career will never actually reach. Vehicles Those afraid of heights can stay grounded with a Pepsi remake of the first-ever Dodge, a Civil War-style Heineken cannon, and a Coke dump truck, which is also the only way to lure Paris away from Castle Island when she's in the mood. And because who doesn't like some softer cans, CDP also rocks a zoo full of aluminum animals including a rooster, crab/turtle (you decide! ), and an Arizona Iced Tea giraffe, who just like Ground Round management, isn't going to stick its neck out for someone who doesn't have even a single year of crayon experience.